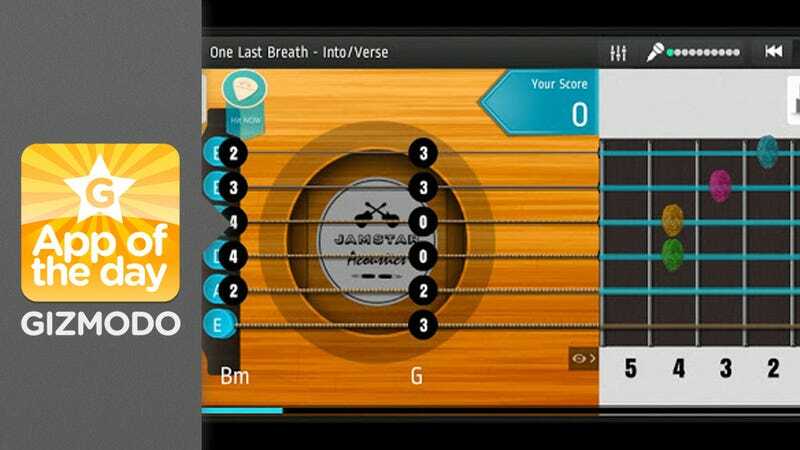 Learn-to-play-guitar apps are a dime a dozen, and to be honest, most of them aren't worth the data they take to download. Light up fretboards are great—until you try to move over to a real, non-illuminated guitar. JamStar, though, works more like a real live, actual guitar teacher would to help you get better on a real live, actual guitar. Listens as you play certain exercises and, depending on your mastery, allows you to move on or sends you back to try again. And again. And again. Until you finally get it right. It even tells you exactly what it is you're doing wrong, too, as you move along through its ever-increasing song catalog. The app doesn't lay out every single pattern for every single note like some other guitar apps. Instead, you learn in a much more natural process, meaning that once you graduate from the app, you'll be able to maintain your skill level even without its guiding hand. The app uses "polyphonic algorithms" to identify the various chords and notes, so if you're strum is off, the app will be able to let you know what the problem is and how to fix it. Plus, Alfred, and educational music publishing company, has joined with the app, giving it access to plenty of both new and classic popular tunes. If you're going to go the self-taught road, this is a nice little addition that won't end up hurting you in the long run.